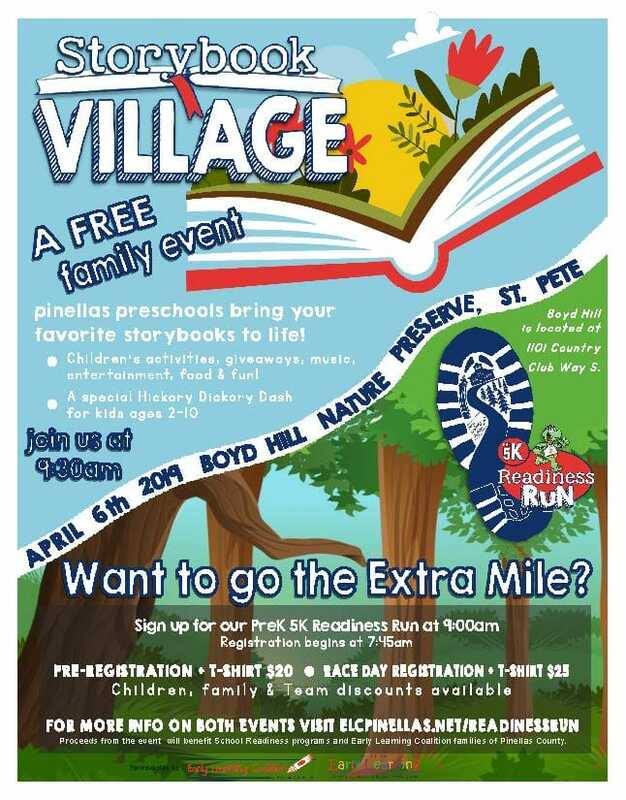 family event & 5K Run on April 6th! Check out our 2018-2019 Dates! Established in 2016, the Professional Development Institute (PDI) is an extension of ELC’s Professional Development department, set to improve the quality of services, support and education for young children. Programs are designed to enhance the knowledge, skills and professional advancement of early childhood professionals through various classes, courses, and conferences offered in face-to-face or web-based formats. To maximize child outcomes through an innovative professional development system designed to empower early childhood professionals and advocates. We believe high-quality early learning experiences provide a foundation for success in life. We believe that well-educated and trained early childhood professionals positively impact child outcomes. We believe working together creates a stronger community. We respect all cultures, backgrounds and belief systems. PDI Instructors will treat all training participants with fairness and respect and will not discriminate against anyone for any reason. All information presented will be respectful and inclusive of diverse cultures. 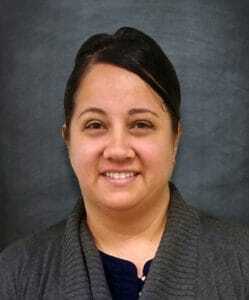 Jaime has a Bachelor’s Degree in Early Childhood/Special Education along with an Infant Toddler Credential and is currently pursuing her Master’s degree in Curriculum and Instruction. For 20 plus years she has been in the early childhood field and was inspired by the endless opportunities teachers have to make a difference. She is committed to inspire, motivate, and support others. Mallory is a Florida native and has been in the Pinellas area since 2011. She has been working in the early childcare field for nearly 10 years and holds a Bachelor’s degree in Preschool Studies. Mallory is a certified PreK CLASS Observer and is working toward her certification for Infant and Toddler. She is also in the process of becoming an Early Learning Florida Lastinger Coach as well as a trainer for Making the Most of Classroom Interactions (MMCI). While she has worked with every age group, the majority of her experience is with infants and toddlers, which is her passion. Mallory’s goal is to share her knowledge with teachers in order to help create a more positive and loving environment for the children they care for each day. 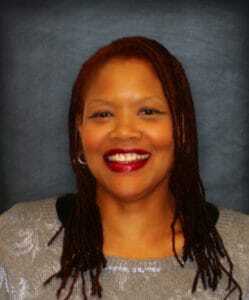 Robin has a Bachelor’s Degree in Child and Family Community Services and Associates in Early Childhood Education. She has worked in various ECE positions over the past 20 years. Robin is a certified Pre-K, Infant, and Toddler CLASS Observer. 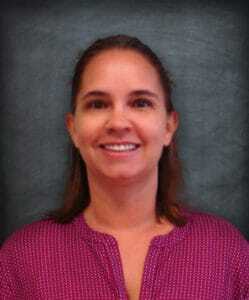 She is also a certified Trainer in Nemours Brightstart. Robin wants to continue to share her knowledge and experience with Teachers and Directors, in hopes they will use the strategies and suggestions provided. For the past 10 years, Robin has worked with 8-11 years old at her church. She is an advocate for all children and loves to see them learn and flourish. 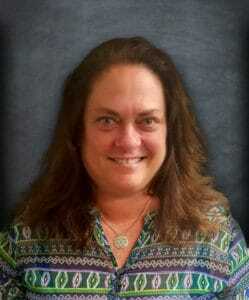 Liz is from Clearwater, FL and has been in the Human Service field for over 26 years. She holds a Bachelor’s of Science degree in Human Services from Springfield College, and is skilled at assisting families with special needs and providing services for preschoolers, school-age children, teens and adults. 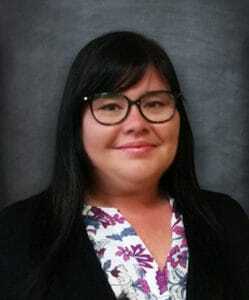 Liz has worked as a Supportive Intervention Specialist and Inclusion Specialist. Liz is a certified PreK CLASS Observer and a certified MMCI Instructor. Liz is a Trainer for Making the Most of Classroom Interactions(MMCI). Liz is an Early Learning Florida Lastinger Coach. Liz is a mother of three daughters and has five grandsons. In the community she enjoys giving back by doing ministry work and working with the middle school age youth and volunteering at Pinellas County Schools. Liz is actively involved at her church, teaching Vacation Bible School (VBS) to 3 – 5 yrs. old. Liz loves being in this field to inspire others and provide quality services to our providers and families. She believes in making a difference in our future by enhancing the developmental skills in children, building relationships with families and providing Innovative trainings for providers. 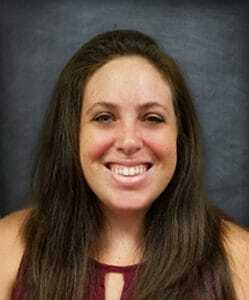 Camille has a Bachelor’s Degree in Preschool Education from St. Petersburg College and is currently pursuing her M.Ed. in Early Childhood Curriculum and Instruction, with a certificate in Positive Behavior Support, from USF. 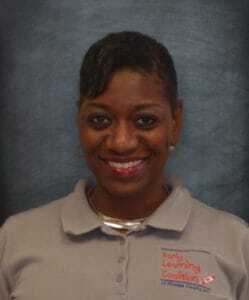 She has held various roles in the field of Early Childhood Education for over twelve years. She believes strongly in the importance of supporting quality care and education for young children through empowering teachers and caregivers. Brett has taught children and teachers from Pre-Kindergarten to College over the past forty-five years. She has a Master’s in Education and had certifications for Kindergarten, Specific Learning Disabilities and Administration. Children inspire her to see the best in everyone. She commits to find the best ideas for them and their teachers to be successful learners in life. Louis is a Professional Development Trainer who has presented for many years for the ELC, NAEYC, FLAEYC, Head Start, OEL/VPK, and privately. He graduated with my two undergrad degrees (BSEd Elementary Education/BSEd Early Childhood Development) from California University of Pennsylvania in 1992, and graduated from their Master’s program (MSEd Early Childhood Education) in 2014. 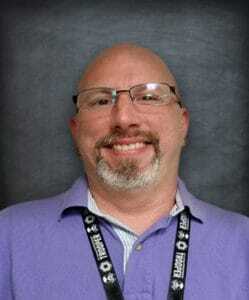 His teaching experience has ranged from 3-year-olds up to fifth grade and has spanned over 24 years. Louis believes that anyone and everyone can benefit from some type of support; trainers have a huge responsibility and he is happy to accept that challenge. Kim is a Florida native. 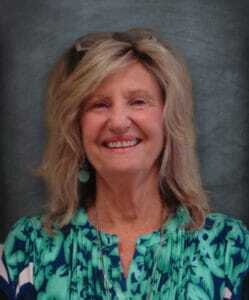 She holds an AA degree in Early Childhood Education from St. Petersburg College and a Bachelors of Arts in Therapeutic Recreation from Belmont Abbey College in North Carolina. Later, she attended the University of West Florida where she majored in Social Work. Kim has over 25 years of experience working with children and providers and believes that positive relationships are crucial to development and learning. She has held many different roles over the years including teacher, center director, Supportive Intervention Specialist, and now a Training and Development Specialist. Kim is a dedicated mother to one teenage son; she is passionate about early intervention and believes in supporting children, parents, teachers and the community. Zoe is a graduate of the University of South Florida and holds a Bachelor’s degree in Communication and Science Disorders. She has worked as a Speech and Language Therapist as well as an Early Interventionist providing intervention services to infants and toddlers with developmental delays within the community. She is also certified as an Infant and Toddler Development Specialist. Zoe has worked in various roles within the Early Intervention field for over 10 years and is very passionate about helping little ones reach their full potential while building her mastery in these areas. She has served on various committees and initiatives in the community and enjoys volunteering her time and efforts in order to give back to the community. Zoe is committed to working in her current role by supporting early childhood professionals, parents/caregivers, and children in her community. Angela holds a M.Ed. in Early Childhood Curriculum and Instruction from USF, and has worked in the early childhood industry for almost 25 years. The birth of her son inspired her to enter the early childhood field. Angela strives to increase child outcomes by providing dynamic training opportunities for early childhood professionals. Catrenia is originally from NE Pennsylvania, where she attended school at ESU. She is currently attending SPC studying Mass Communications. 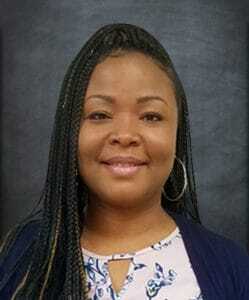 Catrenia has worked in the non-profit sector for over 15 years and is currently a member of SAC and PSTA at Northeast High School, where her son attends school. 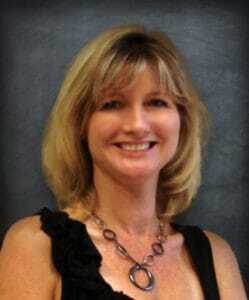 She is committed to providing support and excellent service to providers to ensure their success through PDI. The Performance Funding Project (PFP) rewards School Readiness providers with additional funds for meeting increased quality standards. Click here to learn more and watch WEDU’s piece on the project below. The resource room is equipped with a laminator, book binder, Ellison Machine, and resource books. Providers can use their own materials or purchase them for a nominal fee. School Readiness providers receive three (3) free yards of laminating per month. Please contact Catrenia Wilson-Paul at cwilson-paul@elcpinellas.net to schedule a time to use the resource room. How do I find more information on obtaining and renewing my credentials? 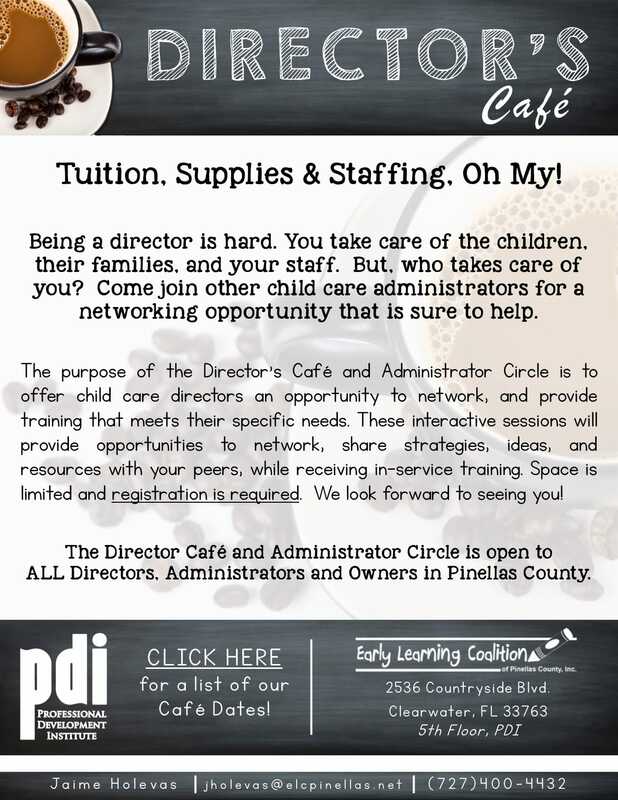 The Early Learning Coalition of Pinellas County, Inc. assists providers who are seeking to obtain their staff credential, VPK Director Endorsement, or their Director credential. We will also help with renewal of credentials. The Coalition began outsourcing CEU’s to FLAEYC in March 2016. If you’ve purchased CEU’s since then, and need a copy of your certificate, please contact Joe Andre at (813) 878-9973. To request a transcript from courses attended prior to March 2016, click here and complete the attached request. How do I get CEU’s? CEU’s are issued through accredited organizations for a fee. The fee is based on the number of CEU’s issued. After attending a professional development training offering CEU’s, you may be asked to complete the required paperwork and possibly an assessment. Once accepted, CEU’s will be awarded. Why would I need CEU’s? CEU’s can be used for the renewal of the Florida Child Care Professional Certificate (formerly the CDAE), the Florida Director’s Credential, or the Child Development Associate Credential (CDA). 4.5 CEUs are required for each credential renewal. Further information on renewal can be found on the Department of Children and Families website located at www.myflorida.com/childcare or the Council for Professional Recognition website at www.cdacouncil.org. CEUs cannot be used to obtain a FCCOC, a Director’s Credential, or a CDA/CDAE. “CEU” stands for Continuing Education Unit. It is used in continuing Education programs as a measure of the time spent in the classroom during professional development and training activities. The Early Learning Coalition transitioned from IACET (International Association for Continuing Education and Training) to FLAEYC (Florida Association for the Education of Young Children) CEUs in March of 2016.